A plastic manufacturer might not seem a natural fit for the environmentally aware, outdoors and action sports crowd, but Fishy Filaments is getting plenty of attention there. 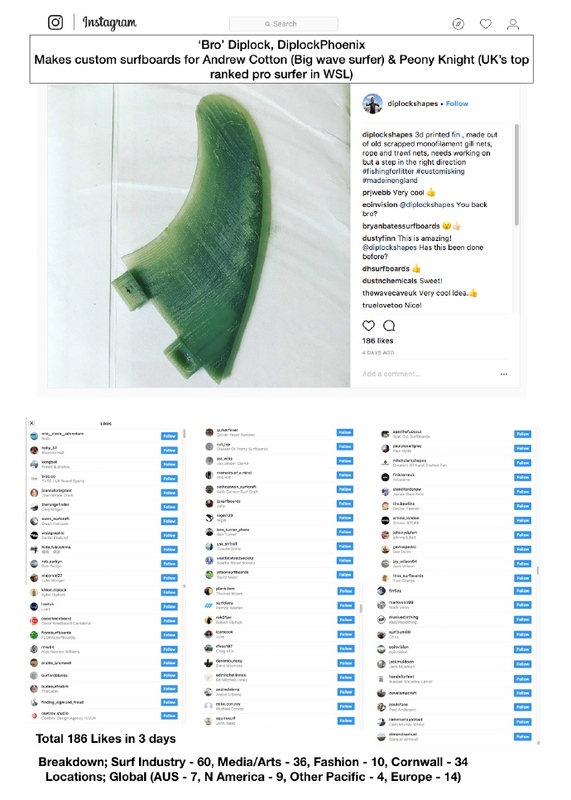 We’ve had discussions with action sports businesses around the world, including two global brands, about providing them 3D printing materials to help them share and re-enforce their messages. The idea that a customer can help do good is a proven one, so allowing a brand to make whatever they wish using a material that aligns with core values such as environmental responsibility, legacy and performance could be a powerful combination. We tested this idea with help from a leading surfboard maker, Chris ‘Bro’ Diplock, using a rough demo piece. Bro custom builds surfboards for Big Wave Surfer Andrew Cotton and the UK’s leading WSL surfer, Peony Knight, as well as other professional surfers. His message is very much one of boards built to individual specifications as a means to reach a high level of performance.